The Travelon 43107500 is an classic shoulder strap made of polyester webbing and leather, that gives Anti-Theft Protection on any bag. The stainless steel cable reinforced strap will prevent the bag from being cut off the user. The strap is adjustable and features a padded, non-slide surface for comfort. It also features top-grain leather, non-slide shoulder pad and fits classic plus bags and most all other briefcases and travel bags. 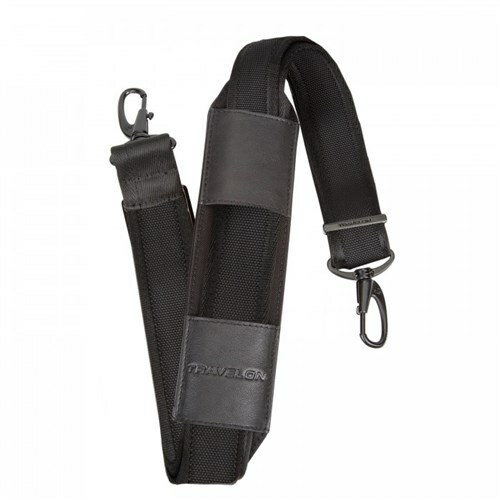 Strap Drop Length: 17" – 22"
The Travelon Anti-Theft Classic Plus Shoulder Strap-Black has many exciting features for users of all types. You can extend the lifetime of your Travelon Anti-Theft Classic Plus Shoulder Strap-Black with the purchase of a FactoryOutletStore Factory Protection Plan. 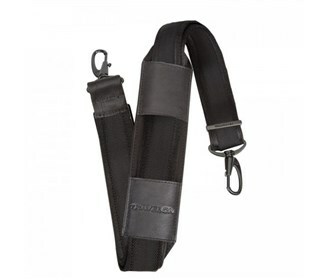 The Travelon Anti-Theft Classic Plus Shoulder Strap-Black is sold as a Brand New Unopened Item.